The European Institute for Climate and Energy (EIKE) posted a video of prominent German geologist Dr. Stefan Kröpelin, who in a presentation late last year in Munich called the notion of CO2-induced climate tipping points scientifically outlandish. He also called the prospect of the Sahara spreading into Europe preposterous. Stefan Kröpelin geographer and geologist who, after his training at the Free University of Berlin, has been working at the Institute for Prehistory and Early History in Cologne since 1995. He is one of the most renowned expedition researchers in the field of “Climate, Cultural, and Landscape Change in Arid Africa,” and is best known for his scientific travels to Sudan and Chad. In his career he has undertaken about 60 expeditions, which have been presented in numerous popular science TV programs. In his lecture, Dr. Kröpelin first gave an overview of the Eastern Sahara located in Sudan, Chad, Libya and Egypt. The region is the driest place on planet Earth today. But thanks to natural climate change over the millennia, this has not always been the case. On the contrary: if you think of the Hungarian researcher László Almásy, known from the book and film “The English Patient”, who discovered “swimmers” on cave paintings in Eastern Sahara as early as the 1930s, you know that the area was once a paradise. Explorer Kröpelin was able to confirm Almásy’s assumptions through his work – and even add an almost unbelievable fact. The paradisiacal humid conditions in the east of the Sahara prevailed between about 8,500 and 5,300 B.C., i.e. after the last Ice Age and at the beginning of the Neolithic, when higher temperatures led to frequent rainfalls, and thus raised the groundwater level considerably, and allowed surface waters and rich vegetation. 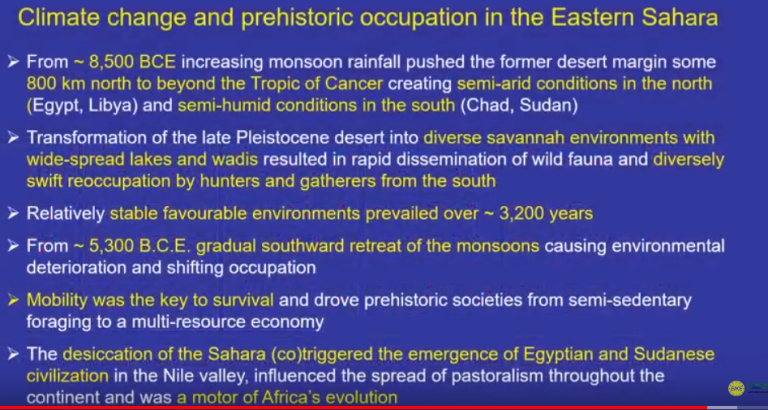 As a result of the gradual drying up of the region over the last 7,000 years, the human inhabitants migrated south to present-day Sudan or later to Egypt, where they founded the Earth’s first advanced culture on the Nile with its fertile floods. The slow drying out of the Sahara was caused by a successive cooling of the climate, analogous to the formation of savannahs through warming. Interestingly, today’s Sahara desert does not have the dimensions it had during the maximum of the last ice age about 20,000 years ago. At that time, the desert extended hundreds of kilometres further south into today’s Sahel zone. How could Dr. Kröpelin reconstruct climate events in North Africa over the millennia? What natural climate indicators does the region offer? One of the best sources of climate data are the deposits at the bottom of the largest lake in the Sahara, Lake Yoa in the oasis of Ounianga in north-eastern Chad, from which as much water evaporates every day as the city of Cologne consumes every day. The loss is compensated by the abundant fossil groundwater resources. But it is not only hidden data deep in the ground that are suitable for precisely reconstructing the past of the climate in the last decades – the human settlement of the region and its legacies are also a reliable climate indicator. Particularly impressive in this context are the aforementioned cave paintings, which were able to withstand the sandstorms and the heat surprisingly well. These prehistoric works of art were not made in a short time, but over thousands of years. The depicted objects like the floating people or cattle herds stand for different phases of the colonization. The proven gradualness of climate change at that time contradicts the “Tipping Point” catastrophe theory, which predicts a “climate collapse” with drastic changes in the environment in only one human generation. In fact, Kröpelin’s research shows that climate change in the Sahara has been so slow that people have hardly noticed anything about it during their lifetime. Stefan Kröpelin also refers in this context to the political use of the current climate catastrophe theory, which is even misused for mass immigration policy. The exponential increase in the world population over the next 50 years is the real problem facing our civilization. Even if there were a massive imbalance in the global heat balance due to airborne volcanic ash for example, the thermal inertia of the oceans will prevent a tipping point in global temperature. There could be immediate regional impacts on agriculture and local temperature though. The fact that climate scientists have found the “missing heat” in the oceans is sufficient to appreciate their utter ignorance of the basis of climate on Earth. But you must admit it’s a good bit of scaremongering by the political control freaks and their useful idiots, the scientifically illiterate eco-warriors. Most people with a functional brain understand that a water planet like Earth is not going to “tip” into runaway warming, at least certainly not as a result of human consumption of fossil fuels! RickWill: Perfectly explains why climate idiots and ignoramuses become climate alarmists. Newminster: So how come modellers constantly talk about tipping points? They believe themselves to have “functional brains”! Perhaps they are lizard people in disguise? Do you really need an answer to that question? What do climate modellers know about climate? Their entire life is spent playing computer games where they define the input, they define the parameters and so they define the outcomes. If “tipping” were a possibility it would have happened millennia ago when CO2 levels and temperatures were higher than they are now. By comparison modern CO2 levels and temperatures are on the low side and we are all still waiting for some empirical evidence to support the ever more outlandish predictions of what is allegedly about to hit us. Like usable nuclear fusion these disasters are 30 years away — and always have been. We humans need not wait for rain – we move rivers .